SoftPlanet makes it possible for everyone to get free CyberLink PowerDVD Ultra download directly from our servers. There is no registration needed for downloading. In the opinion of many users CyberLink PowerDVD 14 Ultra version 14.0.4412.58 is really powerful media player. Its previous release became Media Player of 2013. And we are willing to believe that. This rating is not accidental. If you take a look at the player’s interface, capabilities and support you will probably say the same. This brilliant application has won awards from many famous websites, magazines and forums. There are three paid versions with different feature limitations but a free trial can be downloaded and evaluated for 30 days absolutely free. Septemeber 10th is the release date latest version of CyberLink PowerDVD 14 Ultra. It comes with added support for the brand new High Efficiency Video Coding (HEVC/H.265) format, multi-angle video in MKV files, etc. CyberLink PowerDVD 14 Ultra 14.0.4412.58 enables you to watch YouTube videos offline or select ones to watch them later with PowerDVD. In addition, it integrates UltraViolet service and support embedded SRT subtitles in MP4 video files. CyberLink didn';;;t forget the look of the app. Now you are able to choose between 5 different backgrounds. CyberLink PowerDVD 14 Ultra is full of features and can support all available audio, video and photo formats. Besides Windows XP, Vista, 7 and 8, many users with iOS and Android can enjoy the power of this excellent multimedia machine. It also has a decent language package but the list of its features is the main advantage of the program. They are so many that we will need an extra day to list them all here. Some of the leading ones are: CD, DVD, Blu-Ray, 3D, AVCHD, MKV, FLV, MOV, 3GPP playback, subtitles customization, video transcoding, streaming and sharing features (DLNA DMS), mini music player, instant play and so on. The latest CyberLink PowerDVD 14 Ultra version will literally kill you with its interface. For most of you it will look like it came from space. The startup screen will give you the option to watch some video tutorials or set the media library preferences. Most of the competitors do not offer that. In addition you can register for free and the benefit of that is better support and frequent version updates. You will be amazed once you take a first look at the program's main screen. You will see the real power of this application under the program logo. All modern media formats are well supported and their logos are proof of that. The program menu is grouped in a sleek drop down menus pane to the left side. The player's controls are as usual at the bottom of the screen. The Settings icon is placed in the upper right corner. We tried to find a format which CyberLink PowerDVD 14 Ultra can not play and we couldn't. Moreover with the True Theater HD the program upscales DVDs and standard definition videos to 1080p resolution. For Blu-Ray and HD disks the player adds even more enhancements to boost the high definition experience on large size displays. 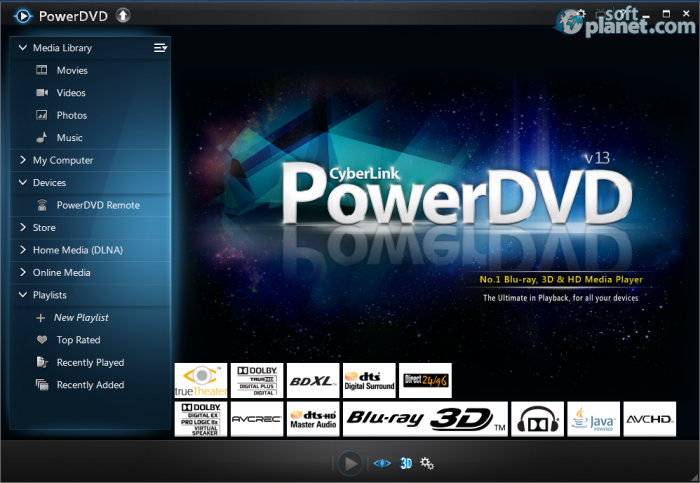 CyberLink PowerDVD 14 Ultra 14.0.4412.58 is one of the world's most powerful media players. Now it comes with even wider variety of supported file formats. Besides that you have 10 GB of free cloud storage for the first year. Isn't this great? Let's not forget its YouTube handy features. Basically, if you are looking for a powerful media player, which handle both online and offline media content, the choice is just obvious - CyberLink PowerDVD 14 Ultra. Please do not hesitate to share you personal observations regarding this software. CyberLink PowerDVD Ultra is VIRUS-FREE! Our security scan shows that CyberLink PowerDVD Ultra is clean from viruses. The current version of CyberLink PowerDVD Ultra has been scanned by our system, which contains 46 different anti-virus algorithms. That ensures that CyberLink PowerDVD Ultra 14.0.4412.58 is 100% safe for your computer.